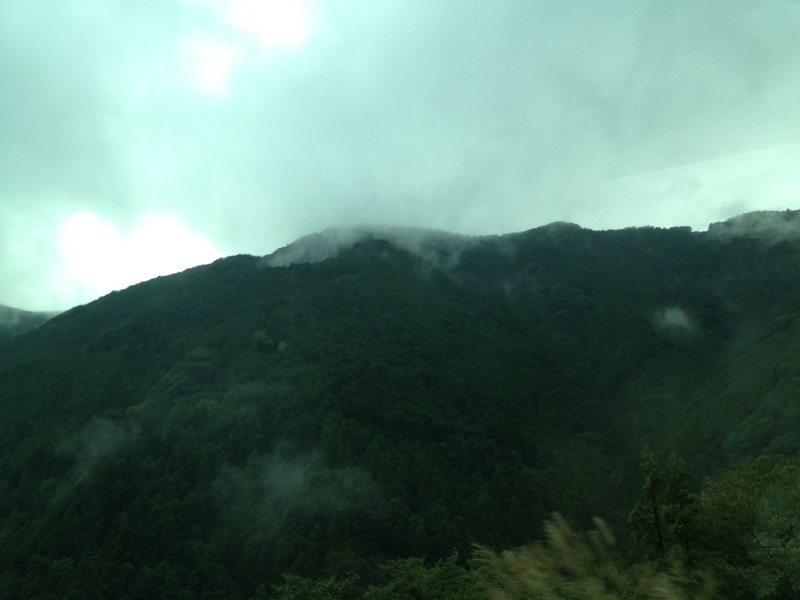 Day 9: Fukuoka to Arita to Miyazaki to Bliss - Kampai! : Kampai! Despite the late night out with friends in Fukuoka the night before, I was up and out of the hotel by 8am to catch an 8:30 train to Arita, traditional home of Japanese porcelain, was was actually the model for Chinese and European “china” as early as the 17th century. Arita is also the home of Munemasa Shuzo, which makes both Nonnoko Kuro and Mizunomai, two very nice barely shochus available in the US. I was hoping to sleep on the train, but it turns out this particular express train to Sasebo does not have English language announcements and I was a little fuzzy on what time I was supposed to be arriving in Arita so even setting my phone’s alarm wasn’t enough to calm my anxiety about missing my stop. I’m glad I didn’t sleep as it turns out, because the trip through the Saga Prefecture mountains was one of the most beautiful train rides I’ve had in Japan. Phone photos snapped from the window don’t do it justice, unfortunately. As the home of Arita ware and Munemasa Shuzo, I expected Arita to be a decent sized city with a good sized train station. Instead I was left getting off in a tiny one room station with only a bento shop and a ticket window. Mai-san, who’d arrived already from Nagasaki, was nowhere to be seen. However, Okaba-san, one of the tojis from Munemasa, introduced himself to me in Japanese. Mai-san appeared from a shop up the street and we were off to the kura. We followed a tour bus into the kura, which I found quite surprising. Even having visited some very large shuzos such as Satsuma in Kagoshima and Takahashi in Kumamoto, I’d never seen tour buses. I knew Munemasa was good size, but not enormous and Arita is so remote, I was surprised this was a tourist destination. This mystery would remain unresolved until later. The kura itself is quite large, a modern facility with the most rigorous quality control standards I’d observed anywhere. We were required to wear hairnets (Kitaya was the only other shuzo to make this request) and white rubber boots (nobody else had requested this) and spray our hands with alcohol (also a first) before entering the distillery floor. 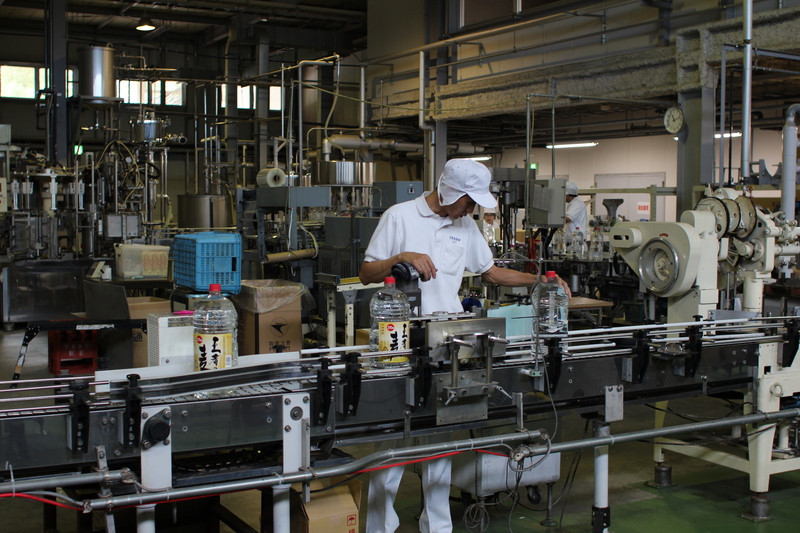 The production line is segregated into large rooms with steaming, koji making, fermentation, and distillation happening in one room, dilution in another, and finally bottling and packaging in another. 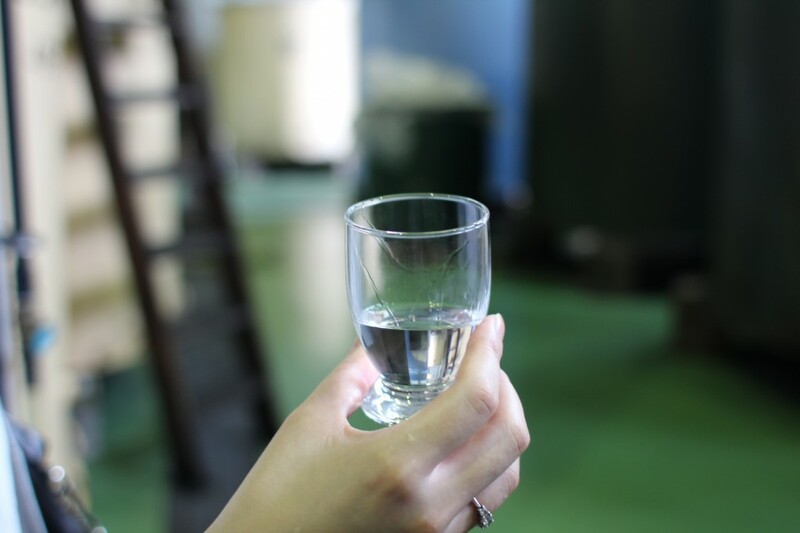 The still was making shochu as we arrived so we were able to taste genshu shochu directly from the still. It’s sharp, almost bitter, a big change from where it will be in 3-6 months in storage and after dilution. The dilution room was the first time someone had pointed out an actual process for this in all of my 20+ distillery visits. 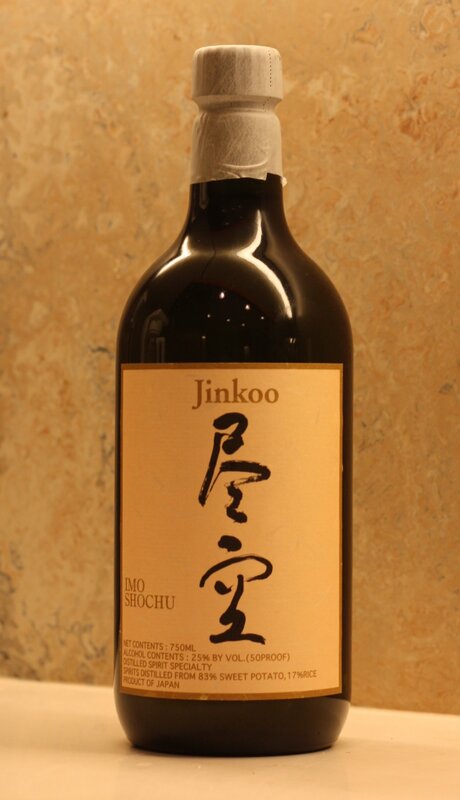 The bottling line was in full process as well as a group of workers filled bottles, inspected the bottles for impurities, capped the bottles, sealed the bottles, labeled the bottles, and packed the bottles. They were fun to watch – each with their own responsibility and working with efficiency and a relative lack of anxiety. It appeared that one guy’s entire responsibility was to turn the handled bottle (these were probably 2 to 3 liter plastic jugs) to the correct position for labeling even though the conveyor mechanism could turn the bottle itself. That finished, we were escorted to the tasting room, which explained the tour buses. It turns out that the shuzo is next door to the Arita ware museum, a massive replica of a German castle that was owned by the largest collector of Arita ware in Europe. The castle sits next to a German style village of shops and restaurants while the omiyage shop and Japanese restaurant retain traditional Japanese architecture. Time and lenses prohibited me from getting a proper photo of this odd amalgamation of architectural styles, but it was quite a shocking image. We tried a solid dozen Munemasa products, all of which carried the signature clean flavors and aromas with a slightly dry, grassy finish, at least for the barley shochus. The most amusing moment was when a large tour group arrived and bellied up to the tasting bar, swarming around us as we tried to enjoy the products. The shacho-san (president of the shuzo) was nudged away from the tasting bar by an eager and apparently thirsty old Japanese man. He took it in stride as only a polite Japanese gentleman possibly could. 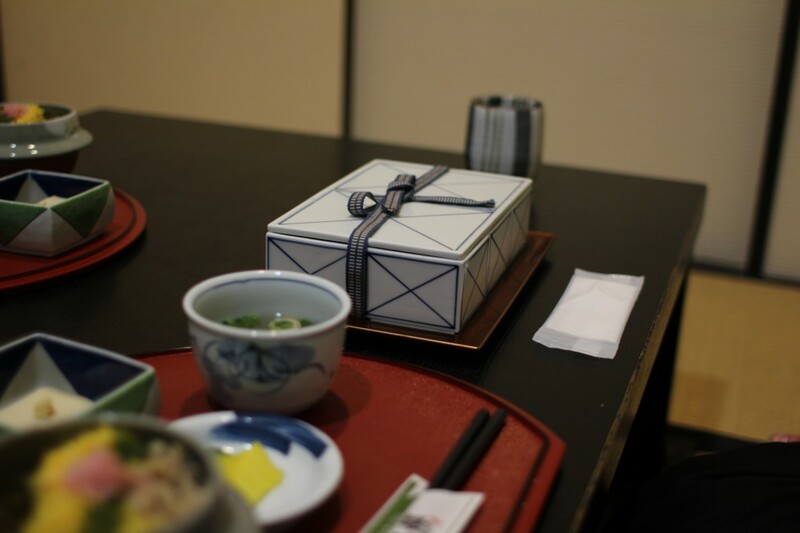 Lunch was a traditional Arita spread served in authentic Arita ware bento boxes. All was delicious as we sat on the tatami in the president’s own room in the restaurant. Afterward we got a full curated tour of the Arita ware museum by the museum’s curator. 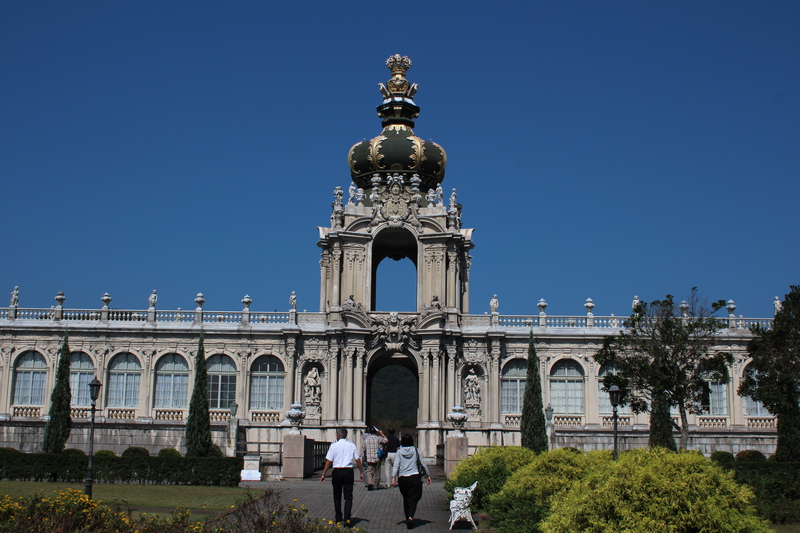 A few curious wandering tourists discretely followed our tour at a distance to catch the stories told at each stop. Without even time to souvenir shop (I really wanted an Arita ware shochu cup!) we were whisked away to the train station for our express train to the nearest Shinkansen station, which we caught to the stop after Kumamoto City for an express bus to Miyazaki City on the east coast of Kyushu. I’d started in the northwest corner of the island and finished the day in the southeast corner. Mai-san had an even longer journey. We were met at our hotel by Watanabe-san of Kyoya Shuzo, the makers of the impeccable Kappa no Sasoimizu and the powerful Heihachiro, two of my favorite shochus from Miyazaki. He drove us to a nearby restaurant, which was the first time I’d been in a completely traditional Japanese restaurant – the kind you see in samurai movies. 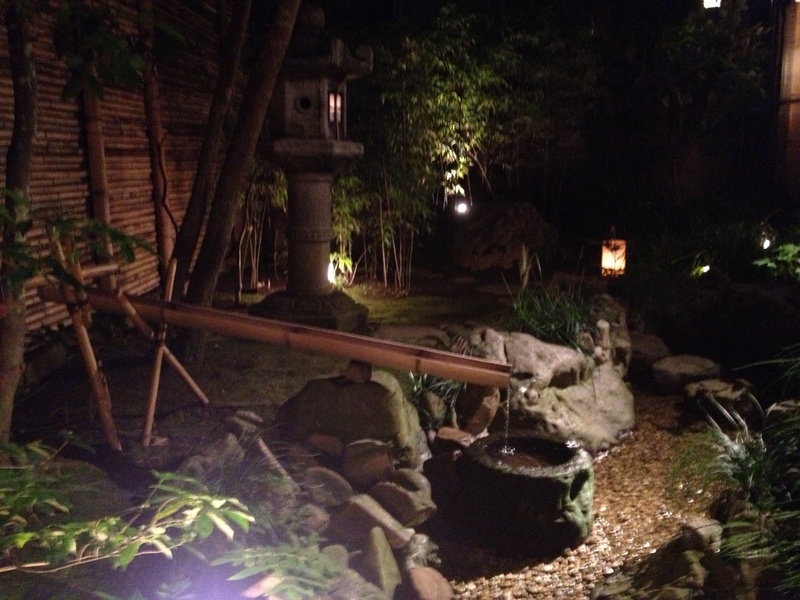 Every room is a tatami with a private view of a garden and its own private washroom. In deference to my American flexibility our tatami had a western table. The meal was, in a word, astounding. We enjoyed the local dishes impeccably prepared and presented while enjoying Kyoya’s most famous shochu, Kame Shizuku, an imo shochu that doesn’t taste of imo since they’re carefully peeled before steaming (skins are usually removed after steaming in most shochu production). 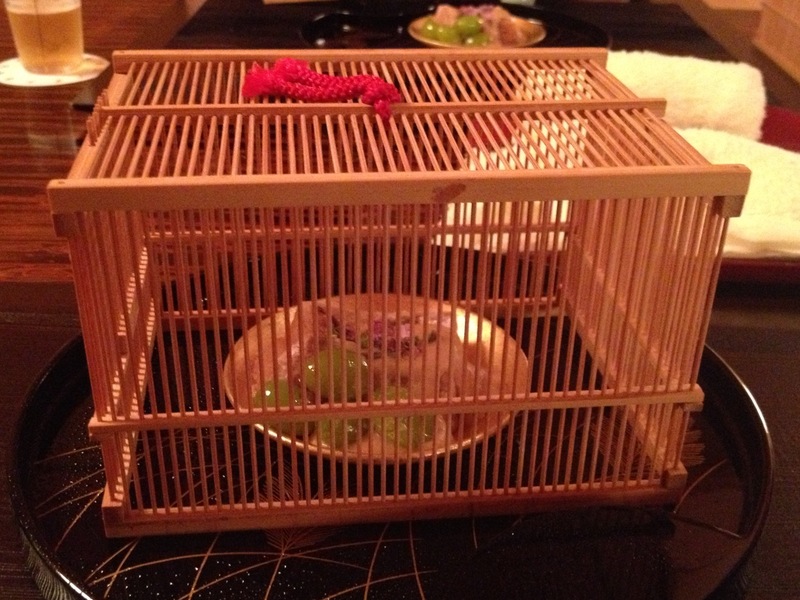 We knew we were in good hands when the first dish came out inside an insect cage. Dinner was long and languid and Mai-san and I were both sleepy by the end thanks to our busy day and long journey. 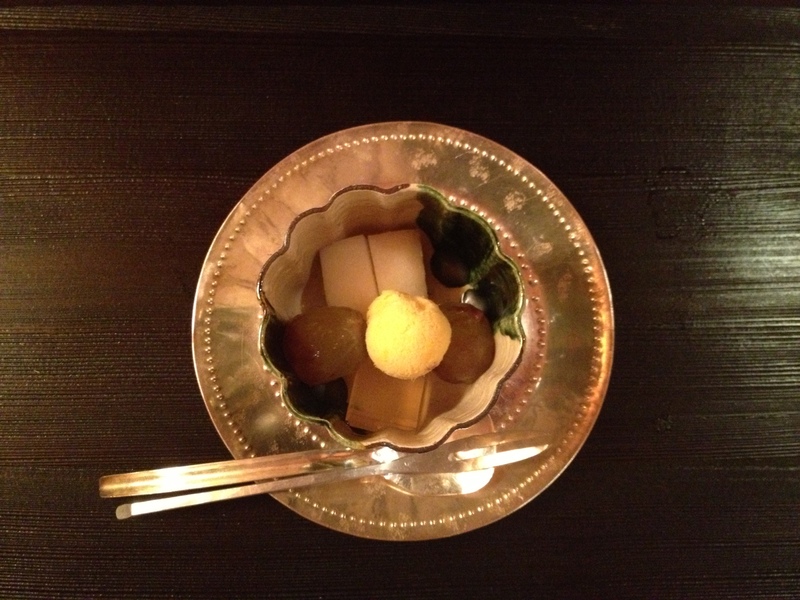 Dessert of mango sorbet and assorted fruits with a 16% ABV imo shochu called Samurai Dance was the perfect conclusion. Watanabe-san would pick us up at 7:30am for the hour drive to Kyoya Shuzo to kick off the next day. Something told me it was going to be amazing if this is how he feeds his guests. What an amazing day! I LOVE their food presentation & hospitality! Your a fortunate man! I’m so sorry about not being able to pick up your Arita cup. I’ll pray that you find one or are given one somewhere on your incredible Journey!